Ya that kinda works. He doesn't flash red so its not as exciting. Also he is really hard to hit with it otherwise. Strange how baragon of all monsters ended up being one of the hardest in the game purely due to his size. I ended up just making that my strategy. I test things and if I see health drop, him flashing red or both, then I'm set. While with other bosses, I just hit them with everything a little bit to see what's best. That's the thing about NES games and fighting game formats; even if you think you have a strategy, then there's always something just as good, if not better to try out. Just tried out the Anguirus code and I gotta admit that in a strange way he's pretty fun to play as (though it'd be nice if he didn't crash the game every 2 minutes). I think it's kinda interesting that the color of the enemies changes with Anguirus the same way it does with Godzilla and Mothra. Last edited by BurningGMK54 on Sat Jan 24, 2015 7:08 pm, edited 2 times in total. BurningGMK54 wrote: Just tried out the Anguirus code and I gotta admit that in a strange way he's pretty fun to play as (though it'd be nice if he didn't crash the game every 2 minutes). I think it's kinda interesting that the color of the enemies changes with Anguirus the same way it does with Godzilla and Mothra. Huh, that's pretty neat, that thought never even occurred to me. I used a Code/Data logger(deletes all the used content from my play through and left anything that was not loaded), opened the Rom in a Tile Editor, and found this Varan sprite, however, that's not really too interesting. I found Rodan a few lines above Varan. I spent at least an hour rearranging the tiles so if you use them I'd like credit for ripping them. Sprite #1 is Rodan's sprite with the Brown colors of the Hex Map Sprite. Sprite #3 is the Hex Map sprite with the real colors. 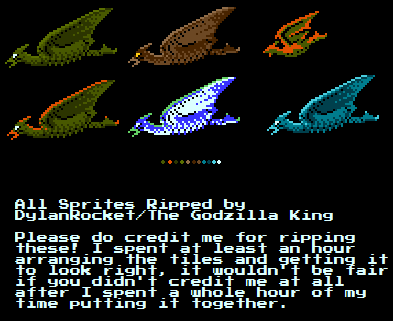 Sprite #6 have the Godzilla Sprites Colors. If anyone else wants to find them in their tile editor for whatever reason, the sprites should be directly below the Title Screen sprites in the US version of the game. What I found interesting was how he's facing left instead of right. That may not seem like anything, but that'd cause him to fly backwards. lol Godzilla faces right in the Tile Editor. 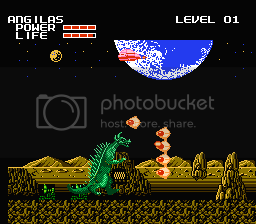 EDIT: Nevermind, Anguirus is like that too. The character is still not functional in game and I have no idea if any of the sprites are accurately colored to how he'd actually look like in the game. Last edited by The Godzilla King on Sat Feb 07, 2015 9:47 am, edited 1 time in total. Cool! What were the original colours of the in-game sprite? Young Guy wrote: Cool! 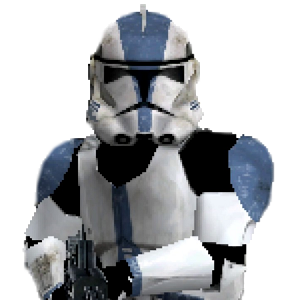 What were the original colours of the in-game sprite? Unfortunately I can't get the character to load correctly. I can see his name above the Health Bar but I can't actually play as him. The screen just sorta flashes for a moment and then I'm back to the board. Seeing stuff like these makes me wish only a little bit more that we'd have the big four Showa monsters in this game. That and my play through of it I did in November would have more to work with and more of a point of reference to make with Anguirus and Rodan added on with Godzilla and Mothra. If anyone wants Anguirus to actually stay on ground during the monster fights instead of floating, turn off the code after you get into the fight. Once the fight ends, turn the code back on. It worked for me in the American version of the game. I pasted his tiles(NES Sprites) on top of the Title Screen to get him working in the US version, and so far, the game hasn't crashed. I'm curious to see how Rodan would play. I'm kinda thinking he might be similar to Mothra, which would make him weak. Anyone else dig the game's OST? I love the Saturn theme. 1tisoygoji wrote: Anyone else dig the game's OST? I love the Saturn theme. The Earth theme, Hedorah's, Saturn, the Planet X/Title theme, Gigan's, MechaGodzilla's, and Ghidorah's to name a few. I even found guitar remixes of a few pieces in the OST a while back. I always had a thing for 8-Bit music. It has a certain charm that can't be matched. 1tisoygoji wrote: I always had a thing for 8-Bit music. It has a certain charm that can't be matched. For me, like with this game, it's the feeling of hearing a different style applied to a film franchise, but it keeps the old school feeling the Showa era had at the time with tinges of Godzilla 1985 in there. Someone remade the King Ghidorah theme of this game and it's awesome. That's a pretty sick arrangement LC. Here's the whole soundtrack here! Here's the listings. There's a lot so I'm going to put it in a spoiler tag. 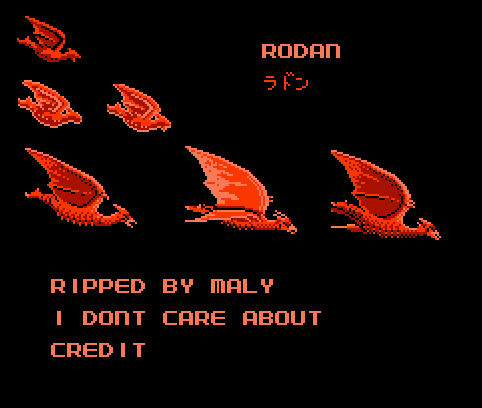 Maly did a much better job piecing together the Rodan sprites than I did and found 2 other frames for him. Last edited by The Godzilla King on Fri Feb 20, 2015 12:02 pm, edited 1 time in total.